This pattern is often referred to as Hydrangea, but I believe the flowers are Lilacs. 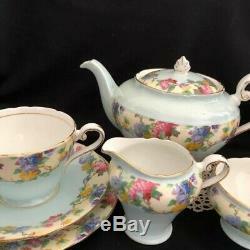 4-cup teapot, teacup trio, small sugar and cream. 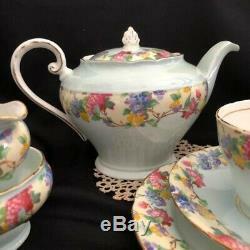 There is an irregular spot on the base of the teapot which might be an old repair or manufacturing fault. Minor gilt wear on teapot handle and spout. 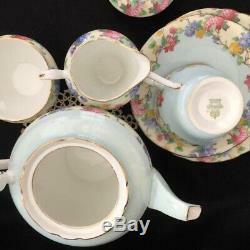 Background colour is pale blue, with that pretty chintzy band of flowers on cream. 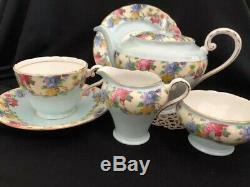 The item "AYNSLEY CHINTZY TEA FOR ONE BREAKFAST SET TEAPOT TEACUP TRIO SUGAR CREAMER BLUE" is in sale since Tuesday, March 19, 2019. 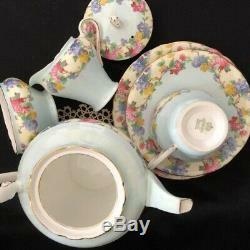 This item is in the category "Pottery, Glass\Pottery, Porcelain\Aynsley". 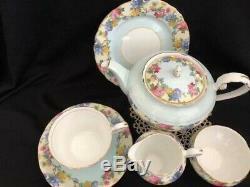 The seller is "inhercups" and is located in Sunshine Coast, Queensland. This item can be shipped worldwide.